There’s no more enchanting way to exchange vows, celebrate an anniversary, or promise yourself to your loved one, than with a traditional Polynesian celebration. Traditional Polynesian wedding ceremonies in Tahiti were not recognized as legal in North America until 2010. Now for the first time, Canadian, US and British citizens can be legally married in Tahiti. Choose from a civil wedding ceremony in the beautiful city hall of Papeete, Moorea or Bora Bora. There are a number of compulsory conditions that must be met, including 180 days advance notice so please plan early and do not hesitate to contact us for further information. A certified copy of both spouses birth certificate authenticated with an “Apostille” (note: the birth certificates MUST have been issued less than 6 months prior to the date of the marriage). Both of the birth certificates AND the “Apostille” MUST be translated into French by an approved translator and legalized by the French Consulate. A “Certificate of Non-Marital Status” (“Certificat de Celibat”) signed by lawyer, translated into French and legalized by the French Consulate. Proof of residency for both of the future spouses (a utility bill or any bill noting names and physical address will suffice). Expedite ALL MATERIALS to the Mayor’s office in French Polynesia at LEAST 45 DAYS PRIOR TO THE CEREMONY of the commune in which the spouses are getting married. After submission of the application file the Mayor’s office will send spouses an approval letter. The approval letter is proof that your application has been approved – you MUST have this document with you on the day of your ceremony in order for the marriage to be legal! On the day of the ceremony, the future spouses guests and the witnesses go to the Mairie (city hall) – hotels can provide the two witnesses if required. The Mayor (or an appointed representative from the Mayor’s office) will perform the ceremony, in the presence of at least two witnesses if required. After the ceremony, the mayor will give the spouses a Marriage Certificate (“Certificat de Celebration de Mariage”). this certificate will be dated and signed by the mayor’s office of the commune in which the marriage takes place and will allow the spouses to prove that the marriage was legal when going back to their country of origin. if the future bride & groom understand another language other than their mother tongue or French (English for example), the ceremony can take place in that language. In the above two cases, it is appropriate that a statement be prepared and signed by the future wedded couple when filing the papers with the Town Hall mentioning “that the couple have a sufficient understanding of the French language to follow the ceremony” or “that the couple have a sufficient understanding of the language chosen to celebrate the ceremony to follow the ceremony”. Furthermore and yet still in a greater effort to facilitate the Civil Wedding Ceremony, witnesses can now be chosen by the Mayor if the future couple are unable to provide witnesses. Even the translator/interpreter can serve as a witness. 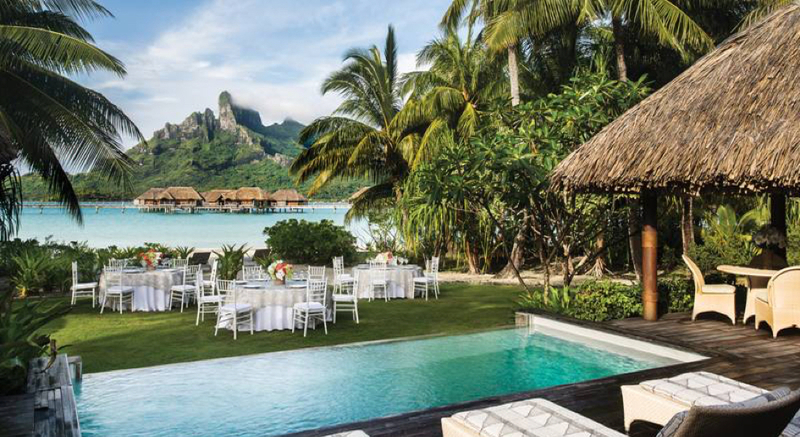 Contact us to learn more about getting married in Bora Bora!